The dust is still settling and the space is still coming together, but please join us for our first open house meeting. Check out the space and see some of our member's projects. Socialize with fellow tech-minded makers and hackers. 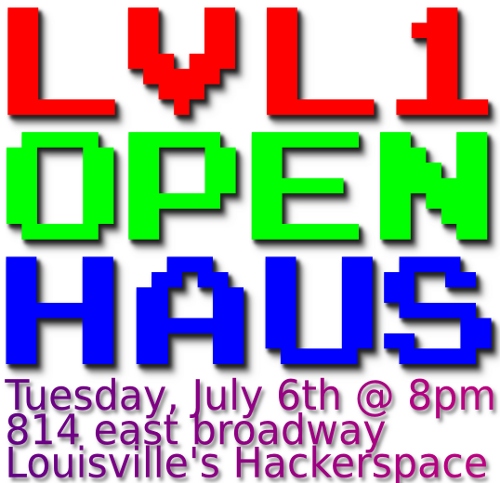 Celebrate the end results of a 9 month sprint that took us from an idea to an actual space for Louisville to call it's own! We'll be meeting tonight at Heine Bros in St. Matthews as usual. Lease details are being worked out for our new space on Broadway. We'll be planning details for our move in to the space. We'll also have a report from those who visited Maker Faire this past weekend. As always; makers, hackers and curious bystanders are welcome to come check us out. The last round of space voting missed the "Go" vote on Hope Mills by only 1 vote! Could this next round tip the balance? A recent push for Okinawa Health Spa has made it a contender for the top spot. Could this challenger be a LVL1 game changer?! Come to the meeting tonight to find out! We are ready to find a space, but we need help doing so. It is time to commit to being a paying part of this hackerspace. It is also time to talk to those real estate contacts and find a great space. Read this post again.